Ho ho ho! Here’s a Christmas present from Chad! 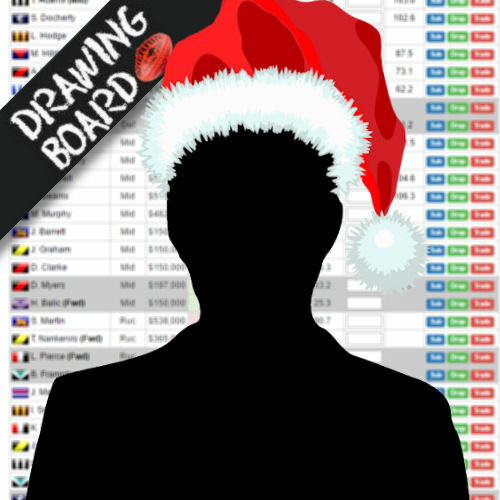 While we are waiting for AFL Fantasy Classic to open in January, our friend Chad at www.dtlive.com.au has got the 2017 version of his popular team picker, the Drawing Board, opened for coaches to start building their teams. The prices are being revealed every couple of days via AFL.com.au – with some great little articles with our hot tips to read – but all of the information around how prices have been calculated are now public. A quick recap on how prices are calculated. $12,600,000 salary cap has been confirmed. Players are priced based on their output last year. eg. 2017 average x magic number (approx 7055 for 2018). Players who missed a full season receive a discount of 30% on their 2016 average. Head to www.dtlive.com.au and under AFL, click on Drawing Board to start picking your squad of 30 players now. You will need a free account to get started. The easy to use and mobile friendly site has plenty of information including what average a player is priced at, their bye round, early opponents and an ownership percentage for registered teams on DT Live. Also, don’t forget to put in your projected average for your own user as well as compiling a site-wide projected average. Copy and paste your team into the comments below simply from DT Live. Mid: Cant go wrong with 5 set and forgets, just not sure if Rocky can reach his old level but he’ll probably prove me wrong. Fwd: Interesting choice with Curnow, will be an absolute gun but just dont see a major improvement in fantasy scores. Maybe try a Lobb who’s cheaper rest of the fwds look alright. I’m also big on Jack Graham from the tigers. Will be priced around the 60’s. He’s going 80+ and 21 games i reckon. Lastly Robbie Gray. 3 years prior he averaged 96+ played alot this year with a groin injury. I know Rocky will take his midfield minutes away but playing free of niggles he could go 90. And you take that. You names a few I was certainly tracking. Ah Chee is one to watch, if he plays in the guts he is a good pick. Personally i won’t be picking Omeara. Not that i don’t love him as a player. But i think he’s just gonna be abit hand ball happy. If his tackle numbers are up tho he’ll be a great pick. Gut feeling says he needs 1 year of consistancy as a hawk before he takes his game to another level. Lloyd is a good pick, im a swans fan and had him last year but i wouldnt exactly call him a must have. A stroll down memory lane! TEAM NAME: The Chosen Won. Talking bout the good old days.. I think Dane Swan is injured bro – lol great trip, I love how you can pull up the old draft teams. Do you remember how you did that year? I ended up 291 that year.. Tempted to swap out one of the three promo defenders and a mid rookie for Cripps and a basement defender. Certainly a unique structure, loading up all your money in the midfield and looking for value in your forward line. I dont mind it but i think there is better value for money in the mids then Zorks for example. With this starting team back in 2015 I came 264th overall in Fantasy is trip down memory lane, I need inspiration as never got close since. RIP all the good Forwards! i am thinking starting Degoey is $560k also in the forwards is POD – thoughts? looks nice how much cash you got? Maybe try for one more gun mid if your setup allows it, just my opinion but our strategies maybe different. Walters is interesting, i nearly picked him myself but beleive there are a few changes going to happen at freo which may affect his scores time will tell. I see many with Lobb i msut of missed soemthing there tell me more about him and why a few people are selecting him. Re Lobb. Now that Mummy has retired, Lobb will be the main ruck at the Giants. He is an up and coming talent who is a contested mark beast. Will get plenty of hitouts and he knows where the goals are. He should push for an average somewhere between 80-95 which I feel is acceptable. Can’t believe he is a forward only at the moment, but he does look certain to gain ruck status in round six. good team, you have sacrificed the forwards to bulk up elsewhere good plan as there is slim pickings. Young maybe good watch JLT and is cheaper than him. Only thing is its hard to trust Suns although is a new coach, but from what ive read so far is they have 38 players all playing midfield this year and 38 players training with the mid field group lol. Best team I’ve done so far, even across all lines, any players that you guys dont like? I know its only preseason but who would you start round 1 between Rocky and Beams. Best I could come up with at the moment… Thoughts? Anyone know how much Ryan Griffen will be? Showing him at 385k on DT Live but given games missed he should be cheaper than that. In any case he’s going to be priced around 45-50 odd. Anyone keen? hI Will just checked Real dreamteam as i have Assistant coach and Ryan Griffin is priced @ $340k if that helps. 21k leftover. I’m sure I don’t have the balls the actually start Gazza but boy is he nice to look at. People need to watch lobb. Last year when mummy was injured they brought in Dawson Simpson, who was the main ruck and lobb the fwd/ruck. If Simpson is playing I wouldn’t be selecting Lobb!!!!!!!! Is anyone getting the “registrations currently closed” for this when trying to sign up?